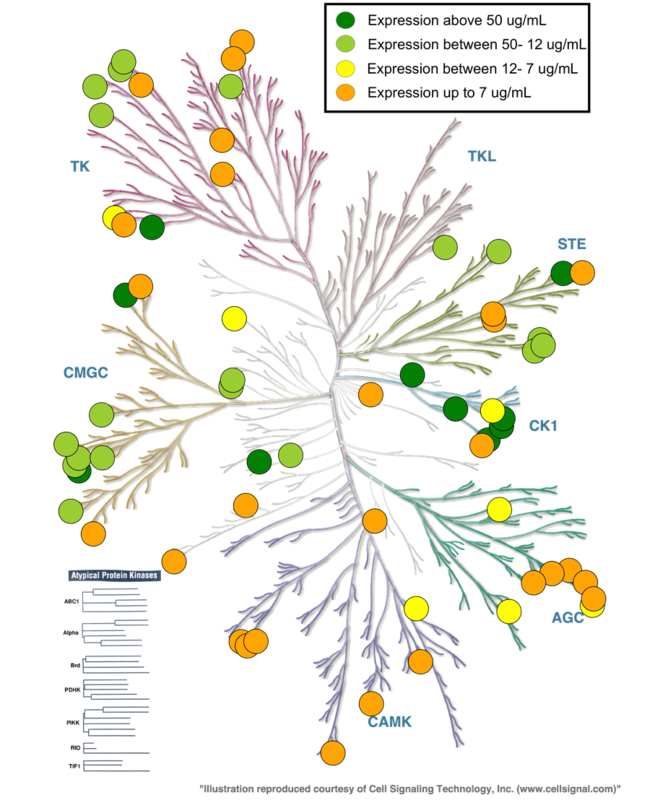 These kinase plasmids were developed through a large-scale expression screen with the goal of generating a library of His-tagged human kinase constructs that express well in a simple automated bacterial expression system. The kit contains 68 human kinase catalytic domain constructs and the respective phosphatases that enhance their bacterial expression. Lambda phosphatase enhances bacterial expression of Ser/Thr kinases while YopH (residues 164-468) enhances expression of Tyr kinases. An open library of human kinase domain constructs for automated bacterial expression. Parton DL, Hanson SM, Rodríguez-Laureano L, Albanese SK, Gradia S, Jeans C, Seeliger M, Levinson NM, Chodera JD. bioRxiv Preprint. An open library of human kinase domain constructs for automated bacterial expression. Albanese SK, Parton DL, Isik M, Rodríguez-Laureano L, Hanson SM, Behr JM, Gradia S, Jeans C, Levinson NM, Seeliger MA, Chodera JD. Biochemistry. 2018 Jul 13. doi: 10.1021/acs.biochem.7b01081. PMID: 30004690. This kit consists of constructs containing His-tagged human kinases that have been optimized for automated bacterial expression. Constructs were generated to be co-expressed with a phosphatase (YopH or lambda) in order to enhance yield. Phylogenetic tree representing kinase domain expression. Authors note that the image was created using KinMap.